Emperor Frederick I Barbarossa drowned on June 10, 1190 not far from the memorial stone in the Saleph gorge (today Göksu) near the city of Seleucia, today's Silifke. The exact circumstances of his death have not been clarified. Even his contemporaries did not know whether the emperor wanted to swim or cross the river on horseback, whether he was swimming alone or accompanied, whether he only wanted to take a refreshment bath or reach the other bank, whether he died at all in the water or only on the shore.. The Staufer emperor Frederick I., called "Barbarossa" because of his reddish full beard, had been on the third crusade to free Jerusalem from the hands of the Muslims with an army of about 15,000 men since May 1189. 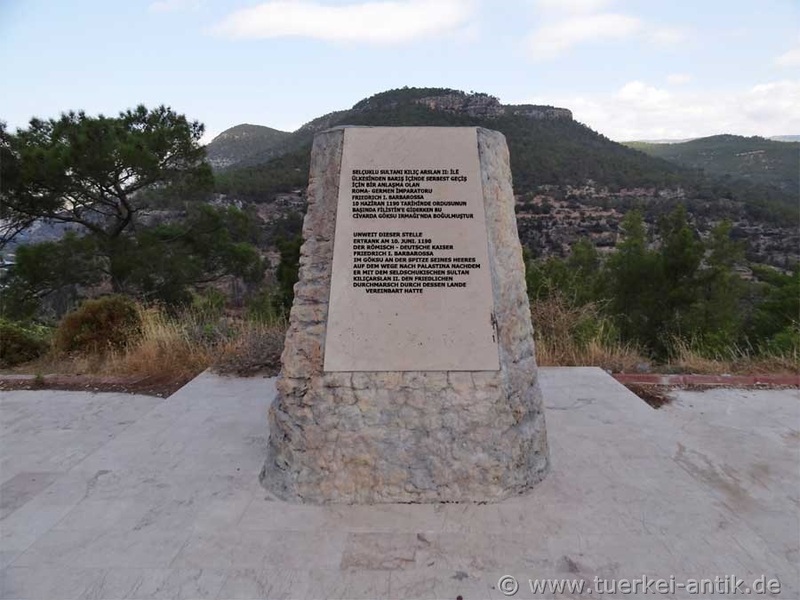 The army wanted to cross the Taurus from Konya to reach Palestine by land. With the death of the emperor, the third crusade came to an abrupt end. 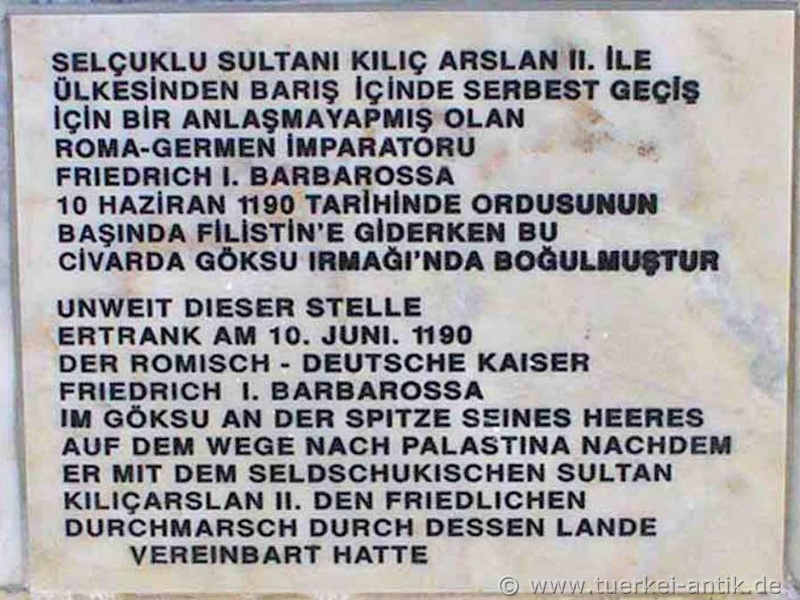 Not far from this place, on June 10, 1190, the Roman-German Emperor Friedrich I. Barbarossa drowned in the Göksu at the head of his army on his way to Palestine after agreeing with the Seljuk sultan Kiliçarslan II. to march through his country peacefully. Barbarossa's guts were buried in Tarsos. The meat was removed from the bones by cooking according to the procedure of "Mos teutonicus" and buried in Antioch at the beginning of July. His bones may have found their resting place in the Cathedral of Tyre. Barbarossa is the only ruler of the Middle Ages whose tomb is still unknown today. After the return of the Crusaders, a variety of news about Barbarossa's death emerged. Even his contemporaries did not know whether the emperor wanted to swim or cross the river on horseback, whether he was swimming alone or accompanied, whether he only wanted to take a refreshment bath or reach the other bank, whether he died at all in the water or only on the shore.